Wine regions usually end up being your favorite vacations. You love the view of grapes and vines with mountains in the background. You enjoy learning about the fertile landscape, the history of the area, and how families became winemakers. You feel calm listening to revving tractors, clanking bottles, and popping corks. The best part is always the tasting at the end. This one is going to be a bit different, though. You traveled to Andalusia to taste sherry. 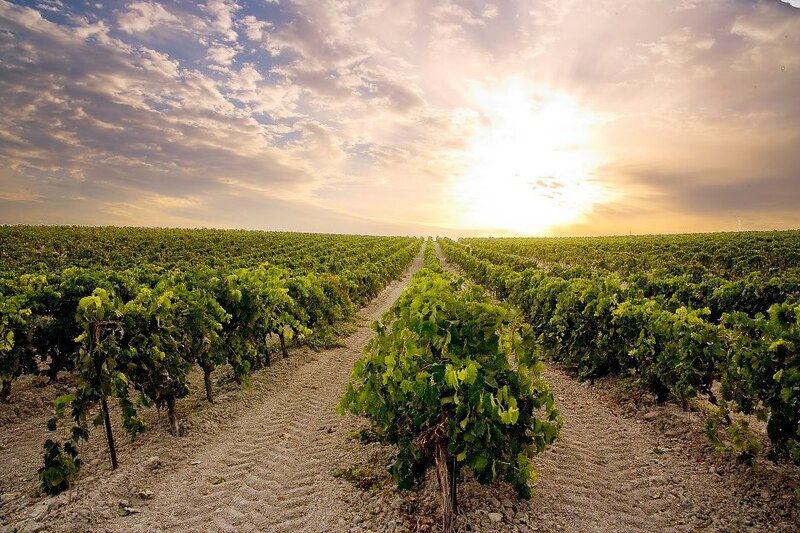 The Phoenicians started growing grapes in the southernmost part of mainland Spain around 1100 BC. When the Moors conquered the area in the 8th century, they introduced distilling into the winemaking process. Brandy and fortified wine were the results. Sherry production took off in the 13th century; it became especially popular in Great Britain. Vineyards of palomino grapes now extend from the border of Portugal to the Atlantic Ocean to the Mediterranean Sea. 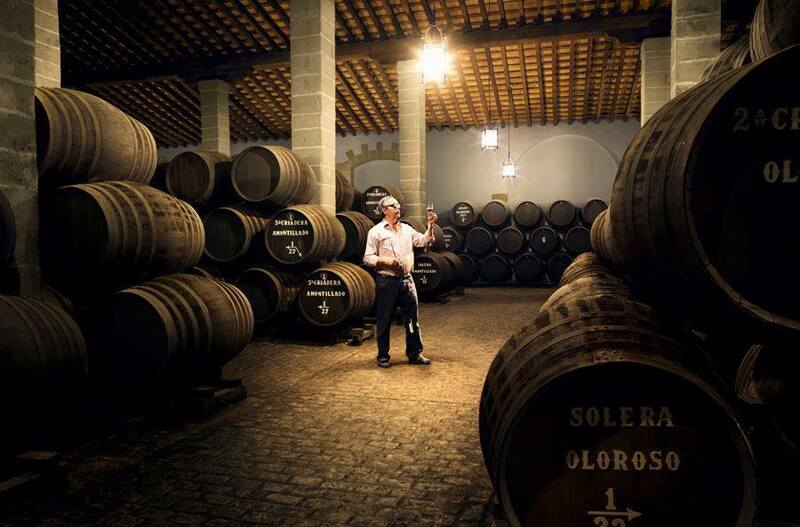 While Jerez de la Frontera has become the sherry capital of the world. In Jerez, you don’t visit the vineyards. Bodegas—warehouses where sherry is produced and aged—are right in the heart of the city. It makes it easy to stop for tours and tastings in between visits to churches and palaces, after Grand Prix races and horse shows, and before the flamenco beats begin. Given the hot, dry summer weather, slipping into a cool bodega is a welcome relief right now. 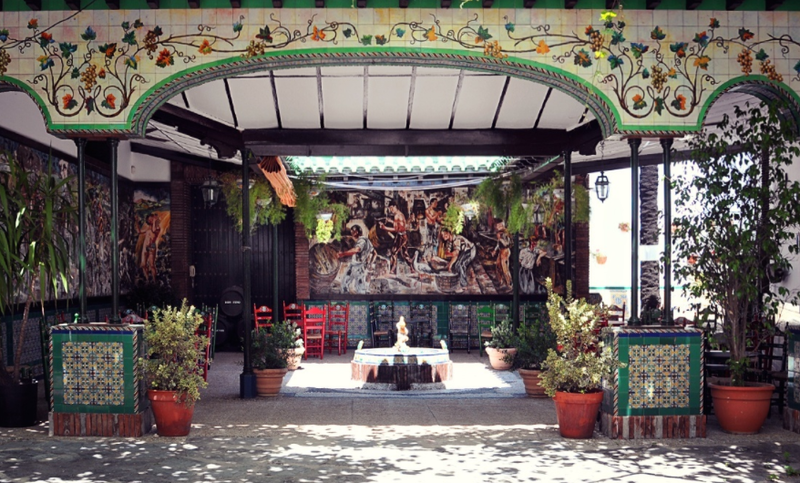 The first bodega you visit is Bodegas Tradición in the old gypsy quarter of Santiago. Though the owner comes from a long line of sherry producers, this bodega was only established in 1998. It quickly made a name for itself. It now houses more than 300 paintings by famous Spanish artists, including Francisco Goya, El Greco, and Pablo Picasso. You can sip their straw-colored Fino, the driest and palest variety of sherry, while enjoying the museum-like atmosphere. Your next stop is Bodegas Sandeman. It’s near the famous Royal Andalusian School of Equestrian Art, the closest you’ll get to a farm in the middle of the city. This bodega has been around since 1790. Its logo, a Zorro-like figure, is well-known by sherry lovers. So are its aged sherries. After touring the historic property, you do a tasting of four very old sherries. They’re aromatic, complex, and rich. They’re also quite rare. You fall in love with the raisin flavor of the Sandeman Sherry Royal Ambrosante Pedro Ximénez 20 Years Old and decide to take a bottle home. There must be room in your suitcase. Bodegas Lustau is the final stop on your first day of sherry tasting. Lustau was founded in 1896 and moved to its current location along the city’s historic Moorish walls in the 1930s. The inside of the bodega is stunning. It looks like a cathedral with high ceilings and lots of archways. Albero—rough, sandy clay—floors stabilize the humidity and the temperature within the sunlit space. Plus tastings range from basic tours to full aperitivo lunches. After tasting so many sherries, lunch sounds perfect. You feast on jamón ibérico, a Spanish omelette, anchovies, cheese, and olives as you sip 12—yes, 12—more sherries. No wonder the Spanish take siestas every afternoon. You’ll need one before attempting to flamenco dance later tonight.